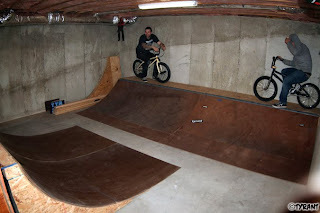 Steve, Arnwine and I spent yesterday hauling wood, cleaning the basement, and re-assembling D. Whip's ramps in a new configuration at the TYRANT's Lair. A huge thanks to Shaun for providing us with a Suburban to haul the wood and making the long drive out to the house to unload it for us. Not much to say except we busted our a$$ working for the majority of the day. Good times and a great outcome! More work going down Tuesday night!